According to a new report released by eMarketer (subscription required), the interconnectedness between TV and the Internet will play a leading role in how the market for online video evolves. The report states that Internet video will establish itself in the content mainstream, right alongside TV. According to eMarketer projections, by 2011 there will be 200 million broadband Internet users. 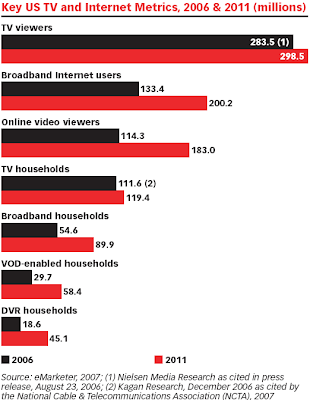 Of them, 91%—or 183 million—will watch online videos. Along with their greater level of engagement in content and advertising—the so-called "lean-forward" mode of the Internet as opposed to the "lean-back" style of couch-potato TV viewing—Internet video watchers tend to be active buyers who act on advertising and content they experience online. Streamers and downloaders of TV network online video are likelier than other Internet users to buy products advertised on the content they watched on the Web. 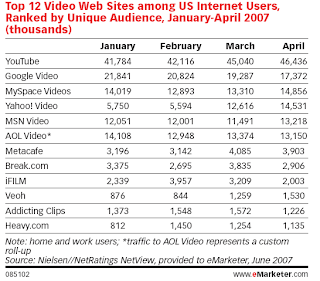 So far, Google’s YouTube commands a sizable lead over other online video Internet destinations, including social networking leader MySpace, network sites and portals such as AOL, MSN and Yahoo! Video. 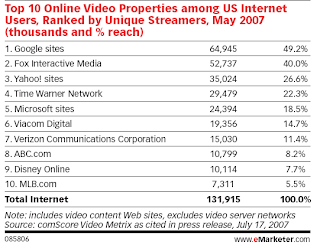 A July 2007 comScore Video Metrix press release cited Google sites (YouTube and Google Video) and Fox Interactive Media (the parent of MySpace) as the top online video properties ranked by both unique streamers and reach. A Nielsen/NetRatings NetView study that tracked unique visitors over a four-month period from January through April 2007 showed that YouTube and Google Video (which the research firm ranked separately) took the No. 1 and No. 2 slots in every month during that time frame. MySpace ranked third, also retaining that spot throughout the survey period.ranked third, also retaining that spot throughout the survey period. According to the eMarketer report, brand marketers in virtually every industry and discipline—from financial services to packaged goods to wireless communications—are capitalizing on this opportunity by creating and repurposing video ads that connect well with the online video audience. As this audience is expected to grow to 183 million viewers in the US by 2011 (up from 114.3 million in 2006), Internet users will increasingly turn to video content as an integral part of their media experience, whether they are catching up on the latest news, getting a sneak peek at an upcoming film, rocking to the latest music videos, checking their local weather forecast or just having a laugh. In the same way as television has offered every conceivable form of programming over the past 50 years with ad support as a backbone, the web is emerging as an equally flexible media channel where content owners, site publishers, marketers and consumers can find what they need.